Match it with your shirt. This could be the final touch to your outfit to a wedding, dinner party or any occasion. Size: 22cm x 22cm / 8.7″ x 8.7″ (please allow 1-2cm difference in size). Please double check your measurement before purchase. 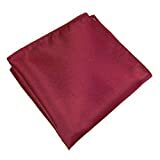 This entry was posted in Wedding Store and tagged Color, Dark, Fashion, Hankerchief, Hanky, Men's, Party, pocket, satin, Silk, Solid, square, Wedding by Formal Affair. Bookmark the permalink.